These are true to their name. Honestly Cute! My daughter's first set of dolls and accessories. She has had plush and other various doll like toys but these are her official dolls, and I'm so happy to see her love it. I've always loved dolls as a kid, but never looked to get her own since she was more into ponies than dolls. I guess it is timing, and now that she is getting close to 4 years old, she seems to love it. She is playing with it in such an adorable nurturing way, all I could do is recommend it to other little ones her age. I always loved dolls, and forgotten how sweet it is to play house and pretend with them. The Honestly Cute dolls and accessories by Jakks Pacific are sold exclusively at Target stores. I've even spotted my little one year old grabbing it and hugging the little dolls. The Honestly Cute line includes "My Sweet Baby" an adorable 14 inch doll and has 4 varieties to choose from. We received this cute doll with blonde doll named "Cuddly" and my daughter loves it. T's the perfect size to hug and carry around everywhere. She was excited to have a perfect baby to fit in those little shopping carts. The dolls come with the outfit they have on, and the pacifier that comes on and off. The dolls have a soft body with the head and legs that are harder, it can sit up and is the perfect balance for a child to play and carry around comfortably. Accessories are available for the dolls. 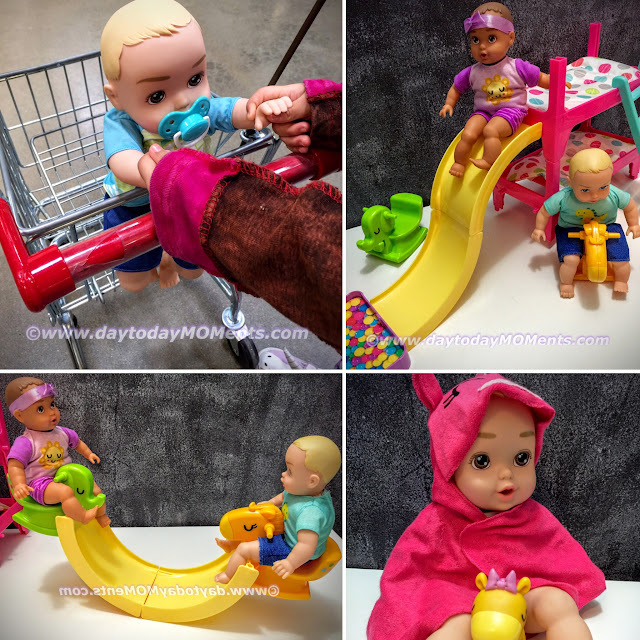 One of the accessories available for the doll is the "Bath Time Set" that includes the towel, wash cloth, and a toy giraffe. Which as you can see, it's just adorable. If you are looking for the perfect gift for a little one that would love dolls, this is the perfect set! This other adorable set, My Lil Baby Bunk Bed Playroom has so much for children to enjoy. The playroom includes a pair of 8-inch mini dolls, a bunk bed, 2 bed mats, 1 ladder, slide, 2 animals rockers, and a suitcase "ball pit". The mini 8-inch dolls are the same make as the 18-inch dolls, and really fun to play pretend with. The set makes possibilities for hours and hours of endless imaginative play. The dolls also fit right in a little back-pack to go. It is multi functional as the slide and animal covers combined converts into a super cute seesaw. I think it is the best set, it promotes imagination, and brings back playing without all the tech, which I think is just as important as all the amazing high tech toys out there. Check them out at a Target near you!